In business-to-business selling the last month of the year is always slow, so I’ve been going through some old stuff. Normal people would take this time to look at pictures of loved ones, photos from old trips and so forth. But I’m a mathematician so I look at graphs and equations instead. Yes, this sounds pretty sad, but in this case I’ll impart some wisdom from a very old piece of stuff I came across. Call centers have two fundamental time measurements that they pay close attention to: average talk time, and average queue time. What does it mean when we say, “our average talk time is 2 minutes”? It does mean that some calls last less than 2 minutes and others last longer, but averaging all them we get 2 minutes. But, how are the call lengths distributed around that average? Does this mean that the probability of some calls lasting 1 minute is the same as the probability of some calls lasting 3 minutes? Is the probability of call lengths distributed on a normal bell-shaped curve with 2 minutes right in the middle like this graph? You might think so, but you’d be wrong if you did. Caller behavior and the way calls get handled create something different. Here is an old graph dating all the way back to 1961 that shows the probability of call talk time lengths with an average talk time of 2 minutes. It’s from some old AT&T data. 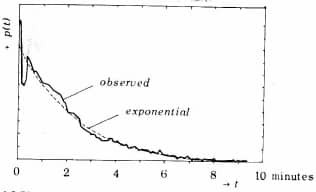 It shows that call lengths follow an exponential distribution rather than a bell curved shaped distribution. Because the average is 2 minutes, the area under the graph to the left side of the 2 minute mark is equal to that under the right. The greatest probability is that calls are handled pretty quickly under two minutes, but there are a lot of calls that take longer and stretch out to 9 or 10 minutes, but with decreasing probability as the times get that long. You’ll notice right at the very beginning of the graph near 0 minutes there’s a spike and and then a dip after which it then settles into near perfectly following an exponential distribution (the dashed curve). This was caused by people hanging up right away because of having called the wrong number, or nowadays pressing the wrong selection to an IVR prompt. The time spent in queue time follows the same pattern because the highest probability for when someone is likely to abandon from queue is the very moment they are placed in queue or soon thereafter. There’s no certain way to avoid this because a lot of people have little to no tolerance for being placed on hold. If there is any alternative such as a company competitive to you, or they’ve called on an impulse, a larger number of people will be of the no tolerance type. Try increasing your ring delay, the amount of time your ACD gives a ring tone to callers before it seizes the call — callers don’t feel they are delayed when hearing a ring.